​Mark your calendars for this big event! On Wednesday, May 8, 2019 @ 7 p.m. 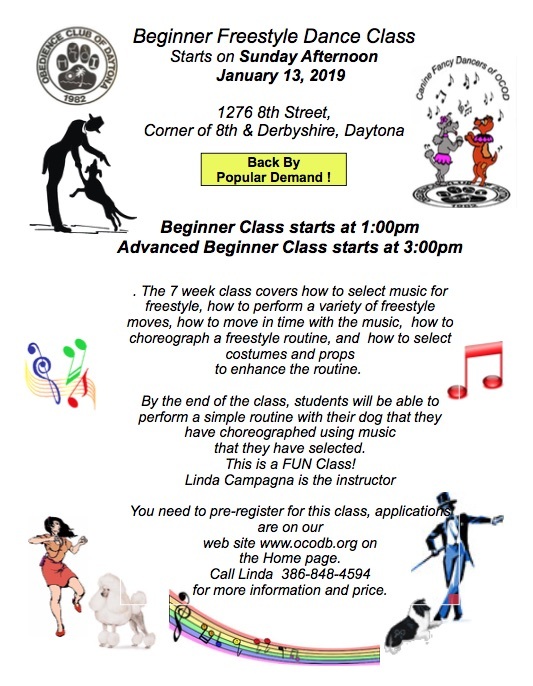 The Obedience Club of Daytona offers weekly classes for students to learn to train puppies, beginner and advanced dogs. Every dog owner's dream is to have a well-behaved and loving companion that responds to his or her commands. Our classes give you a basic education on how to make that happen. The classes are designed to teach you positive-reinforcement training methods that reward good behavior, e.g. manners, come, sit, stay and most of all walking on a leash without pulling, and correct unwanted behavior, e.g. nipping, chewing, digging and jumping. The various levels of instruction include written and illustrated step-by-step lesson plans. Bonus - We are the only dog training club in the area that includes the new sport of canine freestyle, teaching you to "dance with your dog". Advanced classes are offered at our training center, including competition-level obedience and rally. Advanced agility is held off site. Some classes require instructor approval. Please sign up for advanced classes in the signup binder at the front desk. For all classes listed below you must call to preregister before submitting an application. Payment with check or money order is required with all submitted applications.​ Classes fill up fast! Call for availability. Starts April, 2019 at 6:30 p.m.
Starts April, 2019 at 10 a.m.
​Starts Tuesday, April, 2019 at 10 a.m.
Starts April, at 6:30 p.m.
Starts April, 2019 at 6:30p.m. Starts April, January 25, 2019 at 10 a.m.